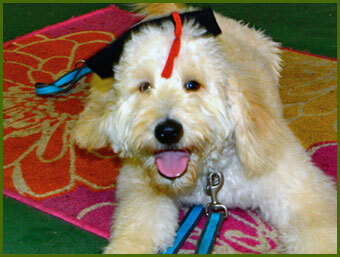 "We had a great experience at Bowser College, as did our dog! The Bowser College training classes gave us the opportunity to socialize our dog with other dogs and people in the class, while teaching him some important basic skills. The owner of Bowser College (Susan) was very patient and knowledgeable - we have already recommended her training classes to fellow dog owners and will continue to do so!" Positive dog training activities are so much better than old fashioned methods because instead of only telling your dog what you don’t want (No! ), we teach your dog to quickly learn what you DO want. Positive reinforcement increases the chance that the right behavior will be repeated again (such as rewarding a successful “Come!”- where your dogs runs back to you.) Positive reinforcement accelerates training and the focus on the desired behavior. As your dog learns to look to you for leadership, the bond between you will strengthen. The use of pain is not found among current dog training methods. Pain is not required for learning; in fact, pain can actually lower your dog’s ability to learn by increasing his stress and making him anxious. Sure we still correct your dog. But, it has no negative impact or any pain associated with the correction. Positive dog training will be more effective, will work more quickly, and it won’t confuse your dog or break his spirit or trust in you – his leader!! Training will be fun for you and your dog, and the time you spend together will be an investment in the future. Just like with humans, making learning fun and rewarding results in a much great level of learning ... and retention! … “Because fear and anxiety are common causes of aggression and other behavior problems, including those that mimic resource guarding, the use of punishment can directly exacerbate the problem by increasing the animal’s fear or anxiety.” (AVSAB 2007). ©2014 Bowser College, all rights reserved.